The 2018 Western Montana Fair was lauded by the Fair industry as the team brought home three awards from the 2018 Rocky Mountain Association of Fairs (RMAF) conference. The conference took place last week in Billings. The Western Montana Fair has earned ten such awards since 2016 and continues to emerge as a leader in innovation and local-minded programming. Fair production manager Tom Aldrich and accounting specialist Pirrie Harris attended the conference, accepted the awards, and presented on the innovations of Missoula’s Fair. The Renner Award for Innovation was given to the Western Montana Fair in recognition of the Handmade Marketplace program, which brought 70+ well-curated local vendors offering hand-crafted art and wares to the Fairgrounds’ historic Commercial Building each day of the Fair. Hands-on activities for kids and artists in residence also filled the building. The program was forged in a partnership with Handmade Montana’s organizers Carol Lynn Lapotka and Courtney Blazon, who promote powerhouse Made Fair events throughout the state. As Missoula County invests in redeveloping its historic building group, it is only fitting to honor the building’s heritage with more meaningful programs. While the program was lauded as a Fair innovation, it is also a throwback to the origins of county fairs, where local crafts and trades people came together to showcase their talents. Lapotka and Aldrich confirmed the Handmade Marketplace will return to debut a remodeled Commercial Building at the 2019 Western Montana Fair, August 7-11. The Western Montana Fair also received an award for best poster in the large Fair category, via RMAF’s Summit Awards Program, which recognizes excellence in design and branding. 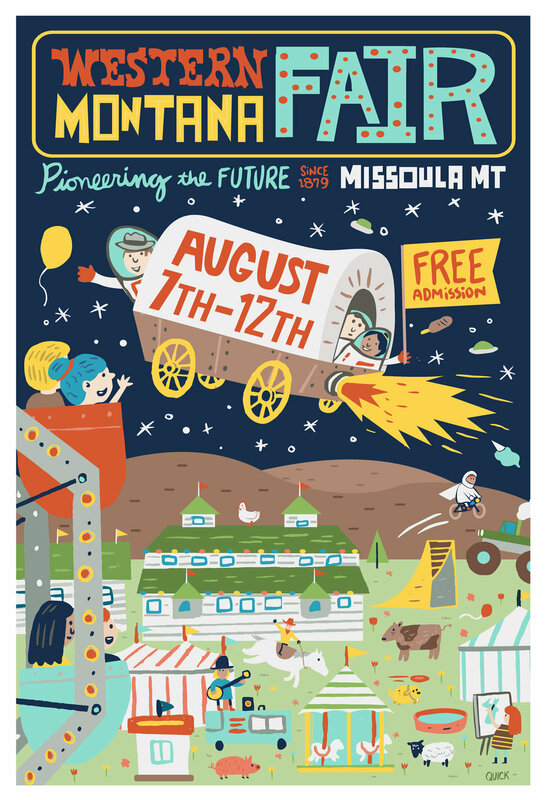 Missoula artist Josh Quick designed the artwork for the 2018 Fair, including the poster, premium book, logo, event program, and graphics. Quick will complete his three-year residence as the Fair’s artist for the 2019 event.